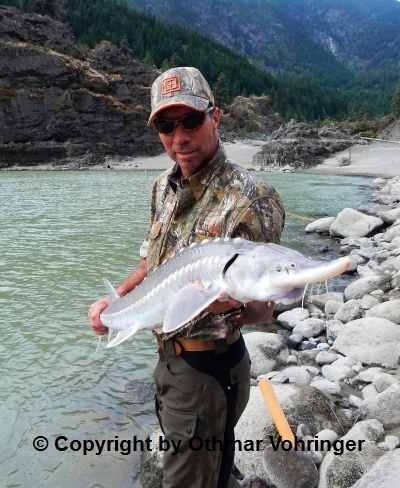 It is no secret that British Columbia is one of the most sought after fishing destinations in the world. Annually thousands of anglers from all over the world travel to our province to fulfill their dream to at least once in their lifetime have been here. With over 400 million dollars in revenue annually added to the government coffers from recreational anglers proves that fishing is very popular and important to our economy. Considering that British Columbia has more than 20,000 kilometers of coastline, tens of thousands of kilometers of streams and rivers and over 50,000 lakes and ponds that hold a large variety of all kinds of fish species you can say without brag: “BC is the best place in the word for fishing”. Having said that, the best place to fish in British Columbia is without question right here in the Thompson – Nicola District. Be that one of hundreds of lakes and ponds, the rivers Fraser, Thompson, Coldwater or Nicola or any of the many other streams that flow though our region you can be assured there are fish to catch. From the prehistoric sturgeon to salmon, trout and many other fish species we have it all here. It has been said, and I believe this to be true, that you can fish in the Thompson-Nicola Region every day for all of your life and you still have not managed to fish every place. The long warm season plus nutrient-rich and clean water in our area are a perfect mix to sustain large and healthy fish populations. In addition, many of our lakes are annually stocked by the Freshwater Fisheries Society of BC with millions of trout of different species. The diversity of fishing opportunities offers a variety of angling experiences for both the beginner and the expert. There are many lakes with a large population of smaller catchable trout that can reach up to four pounds with the average being 15 to 20 inch fish for the angler wanting to catch many fish and for the beginner who is learning how to fish. Then there are the lakes that are managed for large fish, with trout of up to 15 pounds and higher, providing the opportunity to catch the biggest trout of a lifetime. 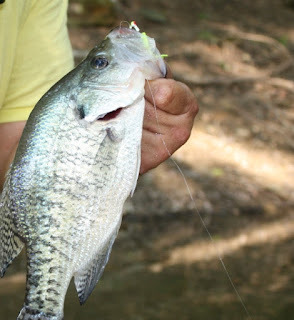 Most of our lakes are easily accessible for fishing from shore and most also feature boat ramps. Some other lakes, often where the best trophy fishing is to be had, are not those easily accessible making a four-wheel drive vehicle a necessity. These lakes also usually have equipment use restrictions (such as fly fishing only) and reduced limits or are catch and release only. Some years ago Merritt used the slogan “Fish a lake a day for as long you stay.” That was a good slogan because it was factual. It also was a testimony to the fact that the majority of the people living here are avid outdoor enthusiasts. As anglers we’re a truly privileged people to live right here in the best place on earth to fish. Unlike the thousands of anglers traveling hundreds and often thousands of kilometers from all over Canada, the USA and the world to come to British Columbia we are never more than an hour’s drive away from world class fishing. Best of all this has been made possible because anglers provide the millions of dollars needed to keep and manage our fishery. For those of you that are not into fishing and wonder what the long lines of vehicles pulling boat trailers are all about on the highway heading towards Merritt, now you know; they are all coming to the place where fishing dreams come true. About a year ago a fishing buddy of mine introduced me to Lyman Lures. Until then I was not aware of this company and the lures they produce, despite the fact that they are just one city over from where I live. For me the introduction to Lyman lures has made a huge difference in that this is now one of my favourite lures to use, simply because they work so well on many fish species and for many different applications. 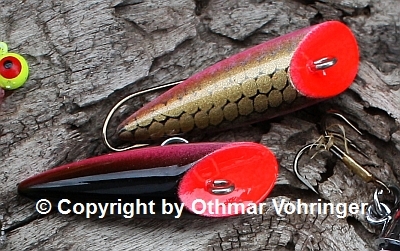 The Lyman lure is basically a wooden plug that comes in many sizes and colours. The lure can be used for trolling and casting techniques and works also well as a top water lure. Lyman lures are widely used on lake trout, rainbow trout, salmon, steelhead and bass, but also for musky and pike fishing. Now that is what I call a versatile lure. The Lyman lure is all made in Canada and is now sold all over North America and Europe. For me the Lyman lure has become an essential part of my tackle box that I would not want to miss. In the video below you can learn more about the Lyman lure company and see the lure in action.To see the large assortment of Lyman lures and colours available visit their website. 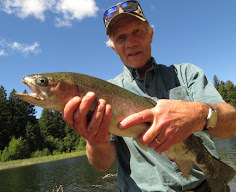 A few weeks ago I received what seemed to me a somewhat puzzling question from a newcomer to the angling sport: “Is it true that you only can catch trout with flyfishing gear?” I had to read the email twice and then again to make sure it was not a much belated April fools. joke. I even did a search on the internet just to try and find out where the writer might have got the idea from that led him to the question. Sure enough, when I searched “trout fishing” on the internet over 90 percent of the information pertained to fly fishing so no wonder that the e-mail writer was under a false impression. 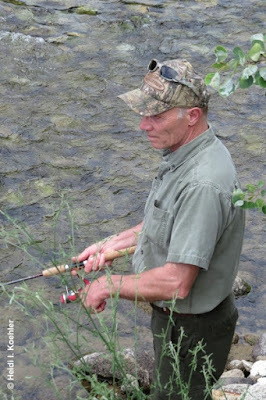 Of course you do not have to be a flyfisherman to catch trout. 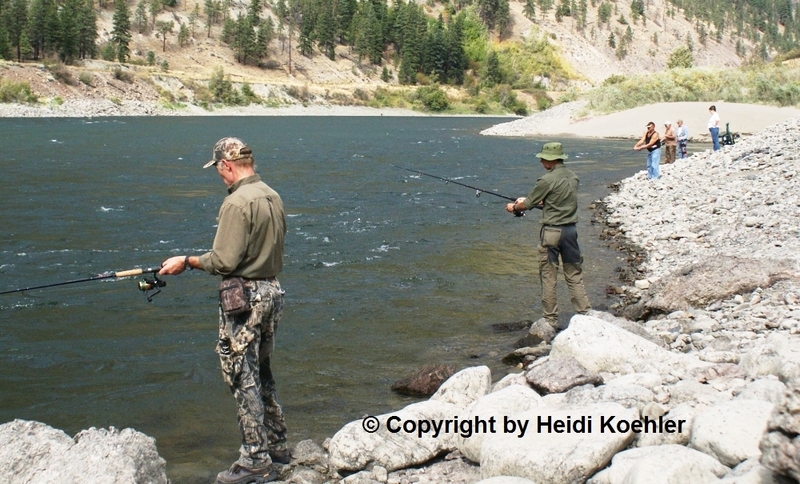 Spinning reel set ups provide an angler with a lot more options to catch trout than is possible with flyfishing gear. “Lure and bait chuckers”, as we’re often referred to, have a huge arsenal of rods, lines, lures, baits and tactics at our disposal that lets us fish from dawn to dusk. On a typical day on the lake I have as many as five rods with me in the boat, each one being set up differently and ready to be used for a specific tactic. In the early morning I may cast spoons, rooster tails and Panther Martins at fish I can see just under the water surface or explore underwater structures like submerged rocks and trees where big trout lay in wait for prey to swim by. 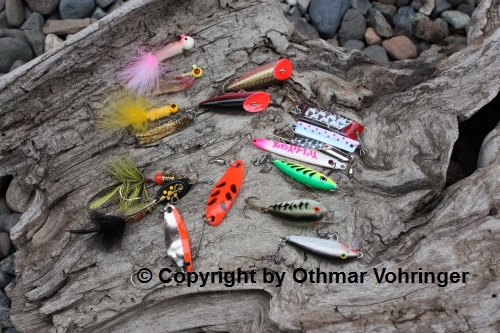 Such lures come in various sizes and colours that let you match the food source that the trout are eating in a specific body of water. If you do not know what the fish eat try a variety of different lures, sizes and colours until the fish start to hit them. When it gets warmer and the fish head deeper down in the lake trolling a wedding band or Lyman plug can yield great results. During midday hours and early afternoon when the sun is heating the water’s surface the trout head for the deepest holes at the bottom of the lake. In this case I make use of an electronic fish finder. Once I’ve found them it is time to try some jigging with small shiny spoons just of off the lake bottom. The rod for this job is spooled with braided line that has no give whatsoever. In deep water , like in Nicola Lake where 80 to 100 feet depths are common, you need that type of line as the regular monofilament line will act far too slow to set the hook on the fish. And then of course there is the simple yet very effective fishing method of worm and bobber fishing. Countless trout have fallen for this very simple tactic which works particularly well on the many stocked lakes around the Nicola Valley. So you see, it does not matter whether you use a fly rod or spinning reel rod to catch trout. What does matter is that you go out and have fun fishing. In this regard I wish you always tight lines. According to the River Forecast Centre, the mild winter in southwestern British Columbia and on Vancouver Island resulted in extremely low snowpack in the mountains. This could cause lower water levels in the rivers. Lower water levels in the rivers mean warmer water and less oxygen. This, in turn, can have negative consequences on the returning salmon. Low water levels and warm water makes what is for salmon an already difficult journey from the ocean upstream to the river or creek where they were born even more challenging and hazardous. This means fewer salmon than forecast will make it to the spawning grounds. In addition, according to Dr. Craig Orr of the Watershed Watch Salmon Society, above normal sea surface temperatures along the north Pacific coast could mean that salmon are likely arriving at the rivers in an already weakened state, just as they are about to embark on the most difficult and dangerous journey of their lives. Last year British Columbia experienced a record year with the highest numbers of sockeye salmon returning to the rivers. An estimated 72 million salmon entered the Fraser River; more than double the number that returned into the river system in 2010, when 30 million salmon began their journey upstream. My wife Heidi and I went to watch the salmon “homecoming” on a visit to the Adams River that year. It was an impressive manifestation of survival, millions of fish fighting their way to the exact spot in the river and its tributaries where they hatched a few years previously. But that was nothing compared to the images and videos I have seen from the salmon returns last year. At times there were so many fish coming upstream that one probably could have walked over them to the other side of the river without getting wet feet. 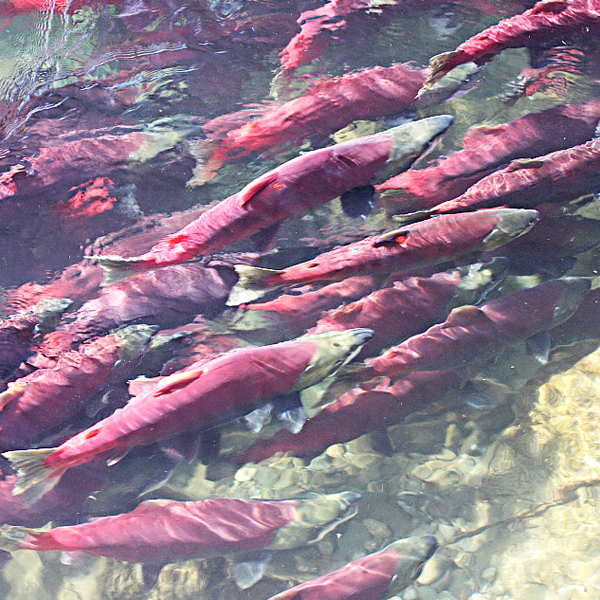 The salmon migration is one of many natural wonders that still is not fully understood. Salmon are born in rivers and streams but spend most of their adult life (two to five years, depending on the species) in the ocean. From there they migrate for thousands of kilometers back to their natal stream and the exact spot where they were born to lay their eggs and then die. To adjust from the saltwater to freshwater and the long journey upstream fighting against strong currents, rapids and jumping up waterfalls, the fish undergoes a complete physical transformation. Salmon returns are constantly fluctuating; there are years when we have numbers like last year, followed by years where we see fewer salmon. Fishery scientists are still trying to figure out all the details of why this is so. While some blame mild winters and climate change, others believe that with growing populations, disease among the fish spreads faster and kills more fish. Still others think salmon returns, or their lack, has to do with rising predator numbers during good salmon years and perhaps even over-fishing. We may never know for sure why salmon migration numbers can fluctuate so drastically from one year to the next. One thing is for certain though: when the salmon start to show up here, I will be somewhere on a river to enjoy one of the most spectacular wonders nature has designed: the annual salmon migration.